The Calcified Crushblat (ホシオトシ?, lit. 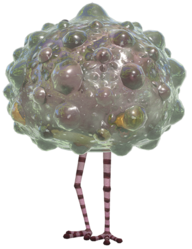 : "Dried Dropper") is an enemy that makes its debut in Pikmin 3. It is a strange creature, apparently just a head with long, chicken-like legs. Its head is usually protected by a thick layer of calcification which can only be broken off by Rock Pikmin and bomb rocks. It is a rare creature, appearing only once in one area in story mode, but appears quite more often in Mission Mode and Bingo Battle. It has the qualifications of a mini-boss, but is not considered as one, as the mini-boss music does not play when fighting it. “The Calcified Crushblat is a large amphibious creature. This well-armored enemy attacks by leading into the air and crushing its victims. When you encounter a Calcified Crushblat, toss Rock Pikmin at the creature's armor to expose the soft flesh beneath it. Once its armor is destroyed, this enemy inflates its body to knock back any attackers. Since the Calcified Crushblat tends to stick close to water, your Blue Pikmin are well suited to survive these knock-back attacks. Unlike the Rock Pikmin, however, your Blue Pikmin are vulnerable to the creature's crushing attacks. This creature is a passive creature, only waking from its slumber if something approaches it. The Calcified Crushblat will start out sitting on the ground with its legs folded underneath it. From a distance, it would look like nothing more than a crystalline rock. Once a Pikmin or leader approaches it, it will stand up and begin walking around the area, attempting to sit on the creatures and crush them. If its armor is still on, it will crush all Pikmin except for Rock Pikmin and Winged Pikmin. If the armor is gone, it will only knock back the Pikmin underneath it, but if the Pikmin happens to be directly underneath the Crushblat, it can be buried. The Crushblat moves at a rather fast pace, despite its appearance. As mentioned, this creature is covered with a crystal armor, making either Rock Pikmin or bomb rocks necessary to fight it conventionally. As Rock Pikmin will generally take a longer time, it is recommended to use bomb rocks. By using bomb rocks, a portion of its armor will be blown off, and a small bit of damage will also be dealt to the creature, as opposed to using Rock Pikmin, which will only do one of the two. After its armor is removed, simply bombard it with Pikmin. Should bomb rocks not be available, Rock Pikmin still prove useful. It is recommended to have a decent size group when fighting this creature, as the Pikmin may constantly end up planted in the ground. With its armor, the Crushblat deals more damage to leaders and can kill Pikmin, so it is advised to get rid of it. On the other hand, the Crushblat moves slower when without armor, so it is recommend to blow about half to two-thirds of its armor off. Another possible strategy is to simply swarm its feet until it dies; however this is dangerous as it can easily crush the Pikmin. A very effective way of using this strategy is by using Winged Pikmin as they can easily swarm its under-section and are shaken away the moment it tries to squash them. This is a very useful time-saving strategy on Twilight Hollow, as you can get the Winged Pikmin to defeat the Calcified Crushblat without having to keep watch over them. Upon its death, the crystal shell will always break, no matter how much you managed to destroy during the fight, and you may then collect its carcass. Something that is calcified has a collection of calcium salts in its body tissue, which is similar to what the Calcified Crushblat has with its protective layer of crystal. The name "Crushblat" is a combination of "crush", because of its main method of attack, and "blat", which is not a word. Its Japanese name is ホシオトシ?, where ホシ? translates to "dried", referring to its calcified body, and オトシ? means "dropping", referring to how this enemy falls on top of Pikmin. Internally, it is called crystal_frog. 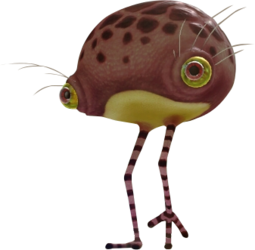 crystal_maro_frog is the name of an unused enemy, which is a Wollywog (maro_frog) with a rock. It is possible that both crystal_frog and crystal_maro_frog were planned to be the two main amphitubers but with some rock or crystal accessory. At some point in development, crystal_maro_frog was abandoned and crystal_frog was reworked into the Calcified Crushblat. Alternatively, the Crushblat's internal name was simply chosen because it jumps like a frog and has a layer of crystal. A sleeping Calcified Crushblat with its calcified layer completely intact. Closeup of a Calcified Crushblat with its armor intact. A sleeping Calcified Crushblat with half its shell broken. A sleeping Crushblat without its calcified layer. The Calcified Crushblat standing up. A Calcified Crushblat attacking Rock Pikmin. A Calcified Crushblat being scanned while its walking around in its crystal coating. An armour-less Crushblat stretching out as it lands. The rear-end of a Calcified Crushblat. It has a pronounced set of buttocks. The Calcified Crushblat in its jumping animation. The Calcified Crushblat, when seen from behind a transparent object, has no calcification. In reality, calcification usually takes around 3-4 years to take place. The Crushblat's appearance when its armor is taken off somewhat resembles the Large-Mouth Wollywog from Pikmin Adventure. Interestingly, the Crushblat's head still expands and retracts after its death. The Calcified Crushblat is the third creature, and only non-boss enemy in Pikmin 3 that requires Rock Pikmin to expose its weak point, with the others being the Armored Mawdad and the Quaggled Mireclops. However, it can be defeated without them with the use of bomb rocks or by swarming at its legs. The Calcified Crushblat will respawn after being killed, but it doesn't respawn with the calcification until a certain amount of days have passed. The Calcified Crushblat can kill enemies in the same manner as Yellow Wollywogs, with or without its calcification. If the enemy is seen from behind a transparent object, its calcification will not be visible. This is a common problem with transparency in game development. This page was last edited on February 15, 2019, at 17:04.